This post is contributed by David Daniels, CEO & Founder, The Relevancy Group. The Relevancy Group (TRG) combines original and thought-provoking market research with unrivaled consulting services to help buyers and sellers alike to compete more effectively within the broader online economy. Epsilon achieved the leader’s ring in The Relevancy Ring—ESP Buyer’s Guide 2015. Sixty-seven percent of marketers are currently using creative services, and another 23 percent expect to do so in the next 12 months—according to The Relevancy Group’s, "The Relevancy Ring 2015 ESP Buyer’s Guide." To be successful in today’s complex marketing landscape, more marketers are turning to a mix of services offered by their email service provider (ESP). The need for an optimal mix of services and platform from ESP partners is increasing alongside the complexity of email marketing, which is why we believe vendors like Epsilon performed well in the Relevancy Ring. Email marketing’s complexity only continues to increase as marketers aspire to centralize customer data and improve message relevancy. The increased use of creative services is in part due to the responsive design and mobile marketing formats that marketers must increasingly utilize. As marketers begin to expect more from their email service provider, the traditional ESP must morph to become an “Everychannel Service Provider” to help marketers meet the growing requirement to centralize messaging and omnichannel marketing needs into one solution. 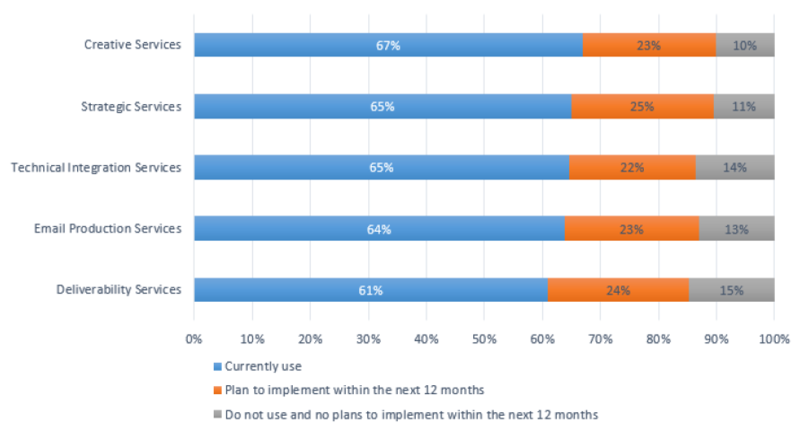 This chart outlines Email Marketing Services Utilization over the next twelve months. Apart from creative services, marketers are also turning to their ESP partner for strategic services, technical integration services, email production services and deliverability services. When it comes to ESPs—it’s all about email execution, inbox placement, wrapped with services and some level of reporting that often falls short of multi-dimensional analysis. Data is not centralized and it is a pain point of integration or constant updating. Every channel service providers have data, services and analysis central to the offering. Data lives in or is fed into the solution via restful real-time smart integration tactics that take the burden off the marketer. The focus is on real-time optimization, as well as services and machine-based learnings in order to predict the best customer paths across multiple channels including the digital omnichannel powerhouse channels: email, mobile, social and display. These channels can be further enriched with data service and analysis. Attribution is central to this deployment option, not an afterthought. In this scenario, intelligence is centralized and execution channels act from the knowledge the marketer or automation tools prescribe. As the marketing landscape becomes more complex service capabilities offered by email service providers are becoming more important. As marketers look for their “every channel service provider” the providers who have data, services and analysis central to their offering will win. To help marketers better understand the role of services, data and technology we are partnering with Epsilon to bring you proprietary research this spring, which will look at the value of services for omnichannel marketers including why services are necessary to coordinate omnichannel marketing and using data to and services together to improve the value of your marketing programs.